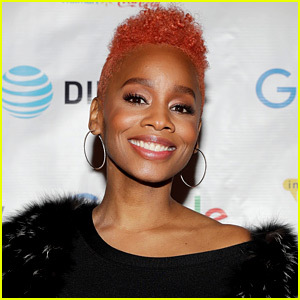 Anika Noni Rose Shows Off New Red Hair at Sundance! Anika Noni Rose speaks on the Bentonville Film Festival’s panel discussion about the importance of diversity and inclusion on Saturday (January 20) in Park City, Utah. The Tony-winning actress, who showed off her new fierce red hair, was joined by fellow actors Colman Domingo, Jay Ellis, and Janina Gavankar for the discussion, which highlighted the need for more female and diverse characters on-screen and how that influences society off-screen. The event was held during the 2018 Sundance Film Festival and presented by Google. It was held at the DIRECTV Lodge presented by AT&T. Anika was at the festival to premiere her movie Assassination Nation, which is currently the highest-selling film at Sundance with a $10 million purchase from Neon! FYI: Anika is wearing UGG shoes. Matt Smith and Vanessa Kirby pose for a picture while attending Audi’s Celebration of the Emmys at the Highlight Room at Dream Hollywood on Thursday (September 14) in Hollywood. The actors were joined at the event by their The Crown co-star Jared Harris. The show is up for Outstanding Drama Series this weekend! 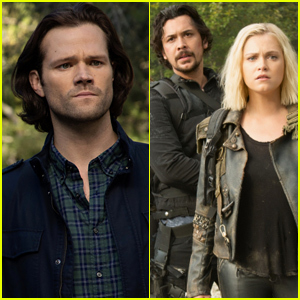 Westworld‘s Tessa Thompson was seen hanging out with Sleepy Hollow actress Janina Gavankar and So You Think You Can Dance‘s Cat Deeley joined her husband Patrick Kielty at the event. 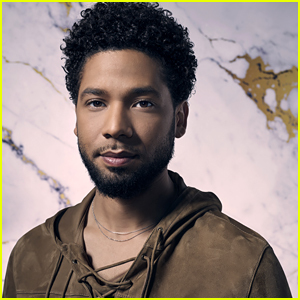 Some other stars in attendance included Transparent‘s Kathryn Hahn, The Big Bang Theory‘s Kunal Nayyar, American Gods‘ Ricky Whittle, and The Walking Dead‘s Tom Payne. FYI: Vanessa is wearing an Elie Saab dress. Tessa is wearing Giuseppe Zanotti shoes. Mindy Kaling was glowing last night at the final season premiere party for The Mindy Project! The 38-year-old star of the show and expectant mom hit up the party on Tuesday (September 12) in West Hollywood, Calif. Also joining her were her co-stars Ed Weeks, Ike Barinholtz, Beth Grant, Fortune Feimster, and Xosha Roquemore, along with series guest stars including Utkarsh Ambudkar, Tipper Newton, Steve Park, and Rebecca Rittenhouse. Janina Gavankar and other additional guests were also in attendance! The final season of the show premiered last night on Hulu – be sure to check it out! Elizabeth Banks & Tracee Ellis Ross Are Honored for Their Excellence at Crystal & Lucy Awards! Elizabeth Banks and Tracee Ellis Ross walk the carpet while attending the 2017 Crystal + Lucy Awards at the Beverly Hilton Hotel on Tuesday (June 13) in Beverly Hills, Calif. The ladies were both honorees at the event. Elizabeth received the Crystal Award for Excellence in Film while Tracee was the recipient of the Lucy Award for Excellence in Television. 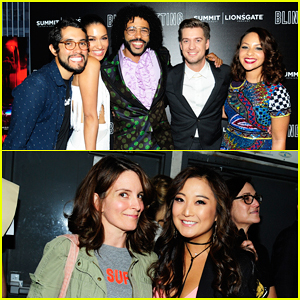 Other stars who stepped out to show their support included Lupita Nyong’o, Amy Landecker, Lake Bell, a pregnant Angelique Cabral, Yvette Nicole Brown, Michaela Watkins, Kate Flannery, Janina Gavankar, Logan Browning, and the event’s host Jessica Williams. FYI: Elizabeth is wearing a Max Mara dress. Tracee is wearing Max Mara. Lupita is wearing a Max Mara jumpsuit, Rupert Sanderson shoes, and H. Stern rings. Lake is wearing Irene Neuwirth jewels. Michaela is carrying a Vince Camuto clutch. Camila Alves looked boho chic at designer Rebecca Minkoff‘s Spring 2017 See Now, Buy Now Fashion Show tonight! The 35-year-old model rocked bright red lips at the event held at The Grove on Saturday (February 4) in Los Angeles. She was joined by fellow bohemian beauties Angela Sarafyan and Taissa Farmiga, as well as Victoria Justice, Keke Palmer, Laura Marano, Jamie Chung, Brianna Hildebrand, Pyper America Smith, Erika Christensen, Jessica Szohr, Aimee Song, Chriselle Lim, Coco Rocha, AnnaLynne McCord, Janina Gavankar, and Emmanuelle Chriqui. Head to our gallery to check out all of their looks! Camila shared the Instagram photo below while backstage at the event. Also pictured inside: Jamie attending an Essie event at The Grove during the same afternoon.